In their seemingly quixotic efforts to reduce emissions, energy companies have increasingly tilted towards windmills. The United States now houses some 45,000 wind turbines on nearly 900 wind farms. That’s enough to power about 1.6 million homes, according to the American Wind Energy Association. Despite the much-hyped natural gas boom, wind is now the number one source of new power generation in the country; 43 percent of the generating capacity that came online last year was from wind. The main benefit of wind power is obvious: It generates no air or water pollution, and none of the carbon emissions that are thought to contribute to climate change. What’s more, wind itself is free, meaning that over the long term, wind farms should prove profitable for utility companies. It also doesn’t hurt that energy companies benefit from a bevy of federal subsidies and tax credits for investing in wind farm projects. Wind turbines come with undeniable drawbacks, though. Many are aesthetic. Today’s wind turbines aren’t the picturesque, gentle windmills that one associates with, say, the Dutch countryside. They’re more like something out of Blade Runner: monstrous, dystopian-looking things that can stand as tall as a 20-story building and carry 200-foot-long blades, utterly dominating their typically bucolic surroundings. They’re murder on birds, killing more than a half-million each year in the United States alone, according to an Associated Press analysis. They’re noisy, generating upwards of 50 decibels when they rotate. (Quiet, rural areas, where most wind farms are located, average about 30 decibels of ambient noise.) And worst of all, because wind is inherently unreliable (sometimes it blows, sometimes it doesn’t), backup power from other sources​—​usually fossil fuels​—​is a must. The power grid cannot live on wind alone. Wind power’s unfortunate side effects have splintered typical ideological alliances, with many greens finding themselves in the odd position of opposing what’s usually cast as the greenest of green power supplies. Consider Craftsbury, Vermont, a New England village so idyllic it looks more like cliché than reality (white wooden church, lovely town green). The view of a nearby ridge has been despoiled by 21 monstrous 459-foot turbines. The noise has also been a problem. Despite the fact that the project is limited to 45 decibels, local resident Shirley Nelson has kept a “noise diary” since the project opened, and has recorded “sleep loss, ringing in the ears, headaches and lapses in memory, which she attributes to the turbines,” reports the Burlington Free Press. Snow and ice buildup on the turbines, meanwhile​—​hardly uncommon in northern Vermont​—​makes them even louder. As one Vermont progressive wrote in a local newspaper, wind turbine projects on ridgelines amount to “corporate vandalism.” The writer has a point: The ridgelines are being defaced by wind turbine projects. (To be sure, she also lamented that wind power is serving to enrich “War profiteer Halliburton.”) And building wind turbines on ridges is a particularly shortsighted move for a state like Vermont, which is dependent on tourism and whose primary natural resource is its justly renowned natural beauty. What’s the sense in trashing your environment for what amounts to only a minuscule reduction in greenhouse gas emissions? Debates of this kind have echoed across the country. In Groton, New Hampshire, local activists are protesting a planned farm of 400-foot wind turbines in a rural area, arguing that conservation is a better way to fight climate change than wind turbine construction. A proposal to place wind turbines in Lake Erie, just off the northern Ohio coast, has drawn a flurry of local opposition. The Blue Mountain Alliance in Umatilla County, Oregon, is agitating against wind turbine construction in its beautiful corner of Eastern Oregon on environmental and aesthetic grounds. And perhaps most famously, in Hyannis Port, Massachusetts, home of the famed Kennedy compound, a proposal to build 130 turbines in Nantucket Sound was mired in political and legal controversy for years, with the Kennedys leading the opposition, until the project gained final approval last year. Shrewdly, anti-turbine activists have tarred wind energy projects with the same kind of language that’s used to demonize big oil. The New Hampshire anti-wind campaigners, for example, cast their fight as one against “Industrial Wind in NH.” FairWindCT, an envi-ronmental anti-wind-turbine group in Connecticut, worries about the “unregulated installation of wind turbines.” Some of the opponents’ objections are silly. Many trumpet the fact that the power doesn’t stay “local”​—​they argue that it’s somehow objectionable that not all of the power generated by the turbines stays in the communities that house the turbines. But that fundamentally misunderstands the nature of the power grid. It’s simplest to think of the power grid like a giant bathtub​—​every power plant dumps its electricity into the tub. There’s no way to sequester the output of one power plant or wind farm and distribute it only to a particular community. But the opponents nonetheless have a strong case. All in all, while wind is the fastest-growing energy source, it still represents a meager 3.5 percent of U.S. electricity generation. With tens of thousands of turbines already built, that’s a clear sign that wind power is deeply inefficient. It provides just a token reduction in emissions at serious environmental, aesthetic, and quality of life costs. Even in gung-ho Germany, where sometimes it seems like every bit of spare land now sports a turbine, wind only supplies about 10 percent of the country’s power, among the world’s highest rates. The United States would have to blanket itself in turbines to make a meaningful difference in its power supply​—​an unlikely and, frankly, undesirable outcome. 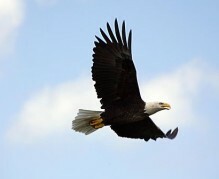 Opponents of wind power got some extra ammunition earlier this month when a study from government biologists found that wind turbines had killed at least 67 golden and bald eagles over the past five years​—​a number it said was probably a profound underestimate. That should bolster the anti-turbine side. After all, how do you ask a bald eagle to be the last bird to die for a federally subsidized mistake?